New Orleans When I’m in India the hawkers, street sellers, and even the recyclers always, and I mean always, ask me what it is like for people who are in their profession in the United States. When I answer the hawkers for example, and say that compared to India, we have almost none, they look at me incredulously, smile, and shake their heads, clearly not really knowing if I’m giving them the truth or pulling their legs. The more than 100,000 recyclers in Mumbai or Delhi or other large cities who collect and then sell to brokers based on their specialties of copper or paper or whatever would be similarly confused. They assume that the richer the turf, the higher the yield, and just maybe the recyclers are right, and we should look at this differently even as a social enterprise. I read a piece in the February issue of Wired about a fellow named Matt Malone in Austin, Texas who for the last nine years has wildly supplemented his day job by dumpster diving, largely in big retail establishments. In two nights of digging through trash with the reporter, he found stuff he could sell for $5000. In India this would have supported a dozen recyclers in our Dharavi Project in Mumbai for a year! In the US it might support a lot of organizing, if done on a systematic basis. Malone had a day job and got into dumpster diving the same way that hundreds or maybe thousands of organizers have before him. He was assigned by his techie outfit the task of coming up with a plan to test a client’s security. He made the natural assumption when starting with nothing that he might learn a lot about them from their garbage. Organizers, especially union organizers, have dumpster dived for decades for old payroll printouts which give a sense of the size of the staffing, wages, job classifications, and other information. Malone’s investment is minimal. He has a flashlight with a magnetic clamp so he can affix it to the side of a dumpster. Other than that, a pair gloves and clothes that can handle rough wear, he’s pretty much set. Here’s the kicker though. He thinks if he worked at dumpster diving 240 days per year he could make $600,000 annually. That’s the kind of figure that gets your attention. My recycling members in India would be ashamed to have me as an organizer, if I didn’t look into this dirty gold mine more closely. I’m not saying it wouldn’t be work. I’m also not saying that there aren’t costs involved, just as I know from watching our Indian recyclers work. It meant a lot when we got a pickup in Mumbai. You need an area to sort. You have to make the sale and do so at a fair price. It’s hard to find money for building peoples’ organizations. As the saying goes, “money doesn’t grow on trees.” But, seriously, there may be a gold in the garbage that we are well qualified to mine! Dallas So-called voluntary inclusionary zoning in New York City allowing private developers to add more density and receive tax breaks in exchange for constructing a certain number of affordable housing units has led to controversy, as the city tries to make the program mandatory for new developments and as developers exploit loopholes that allow segregation of the affordable units from the luxury spaces. Separate entrances around the block or down the street have led to talk of a “poor door” increasing discrimination and inequality for those with lower income as the city continues to evolve as the playground and precinct of the rich. To be clear the affordable units are income based at around $50,000, so this is a long way from section 8 or public housing. Advocates of affordable housing are disagreeing about the impact of the income segregation. Some are of the “any port in a storm” school and ready to accept anything the developers want to do, as long as they build some affordable units in a city desperate for such housing. Others, including thankfully the Mayor’s office, are clear that they will close the loopholes in the original ordinances that allowed for such segregation. For my part I can’t get my mind out of Mumbai as I hear and read about this issue. In Mumbai the Bombay Municipal Corporation for a number of years has had a housing scheme that couples slum clearance with affordable replacement housing and usually luxury condos and apartments constructed by private developers, so it is possible to imagine how unit and income segregation can, and perhaps will, evolve. Real estate in Mumbai, like New York City and many other cities, is at a premium especially closer to the central districts. A private developer can win permission to build in areas where there are slums if they are willing to clear the slums and construct replacement housing at 200 meters of so for the existing residents. The rest of the footprint allows for construction of high rise luxury housing, literally side by side or across the street from each other. It is amazing though to visit some of these developments even two or three years after they are constructed. 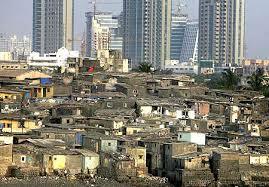 Physically the contrast is immediate in Mumbai. One is a soaring tower of marble and glass and the other will be five or ten stories of box-like construction already discoloring and deteriorating. Visiting families inside means a 10-story walk-up. The elevators, once broken are unrepaired and frequently become garbage receptacles. Where in one area the grounds and entryways are immaculate in the other there is no plan for maintenance and upkeep. The materials and construction are shoddy and substandard. The letter of the housing scheme is followed but not the spirit. In Mumbai it is easy to see what the BMC was trying to do in killing two birds with one stone and a private developers’ money, but it also easy to see what happens once the developer washes his hands, collects his money, and is gone as well. In New York the allowance seems to be that the affordable units can also be in “the same community,” meaning at a distance from the higher rent district. Clearly, building codes have to be met, which is also technically the case in Mumbai, but there’s no evidence that cheaper materials and construction would not be permissible. The whole business model for private development is for the developer to cash out and get out as quickly as financially feasible. It is unclear in New York how long term maintenance might be handled, especially in the segregated, affordable units. As a matter of not only public policy, but logic, the more integrated the affordable housing is with the rest of the units, the greater the likelihood that the social benefits will inure to all residents and that the collective good of the common housing will be protected and maintained. We may need affordable housing at any price and at any place possible, but without full integration of the units, the future will look like Mumbai with gated highrises permanently attached to sister slums, rebuilt vertically, rather than horizontally. This is not about pool and gym privileges. This is about the need to build an integrated, equitable community with public dollars and incentives, and the chances of achieving these goals for everyone is through the same door and sharing the same spaces, not separation and segregation.